The original Radeon DDR 64MB, now sweet sixteen years old. As the years roll by, I find myself becoming more interested in historical facts and data, which is odd since I really didn't care much for history classes back when I was in school. But I'm getting older, and besides grumbling about how I had to walk uphill both ways in the snow on my way to school, I enjoy reminiscing at times. This past weekend, former ATI employees got together for their annual reunion, and one of my Facebook friends, Godfrey Cheng, posted a short anecdote on how the Radeon got its name. I hadn't heard the story before, and I felt it was good enough to pass along. Going way back to pre-2000, ATI was one of the top graphics chip companies. 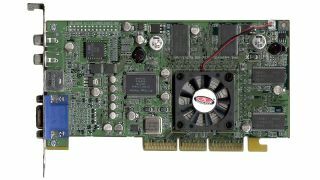 ATI's Rage GPUs were one of the first solutions to integrate both 2D and 3D graphics, and the company did really well when the industry transitioned to the now-defunct AGP standard. The next Rage chip was the Rage 128, and it had some serious issues, not to mention increased competition from Nvidia. The chip at the time was complex, with four all-layer spins (i.e., revisions) and "countless" metal layer spins. In short, Rage 128 wasn't all it was cracked up to be—Godfrey goes as far as calling it a "disaster." The sequel to the Rage 128 was codenamed R100, which could have been subtitled A New Hope. It was their first fully compliant DirectX 7 GPU, and it was a fresh start. ATI had moved from the Rage 128's 250nm process to a new 180nm node, reworked the architecture, and the company felt it had a winner. Phil Eisler advocated that a new name was needed because the Rage 128 had ruined the Rage brand; the official name for the R100 was going to be Radium. This sort of thing is pretty common—notice how quick Microsoft was to distance itself from the Vista branding, for example. Everything was ready and the Radium was heading to the launch pad, but three days before the launch, ATI's Japanese team said that they "could not have a name that was associated with radioactivity." Cue the sirens and raise the alert to DEFCON 1. Everyone was in crisis mode (no, not Crysis—that would come later). Godfrey explains, "Phil, feeling the weight of the world on his shoulders, had dinner with his family in Florida. Phil's family had always been a source of strength, and he explained his dilemma to his mother. After some thought, he decided he had to change the name from Radium but he liked the way it sounded. Tada: Radeon was born." Given the timing, I wonder if there are any "Radium" logos or stickers available—it would be cool to see the abandoned logo. Whether or not the name change mattered is difficult to say—that which we call a rose by any other name would smell as sweet. But I've learned to never discount seemingly small decisions. That group of ATI people ultimately helped pave the way for the current design wins with all the major consoles, for example. The one constant in life is change, however, and most of the old ATI R100 "Radium" team has moved on. Dave Orton is with GEO, Bob Feldstein is now at Nvidia, Rick Bergman and Godfrey are with Synaptics, and others are scattered around the tech world at places like Apple, Tesla, Sony, and Electronic Arts. But wherever they are, hats off—the Radeon name lives on.